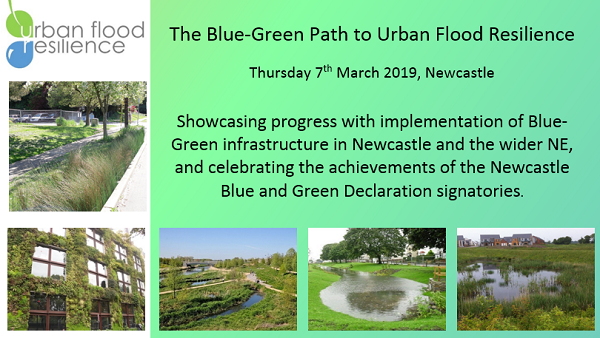 On 7th March 2019, the Urban Flood Resilience consortium and partners in Newcastle showcased progress with the implementation of Blue-Green Infrastructure (BGI) and shared key findings from the interdisciplinary research project. 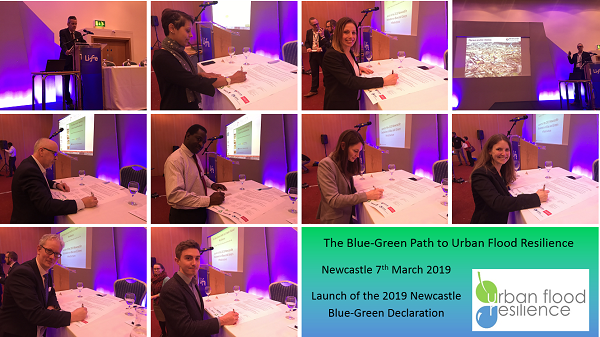 The 2019 Newcastle Blue and Green Declaration was launched, committing signatories to greater use of multifunctional BGI in projects and piloting new ways of working to realise the multiple benefits. The event was organised into two sessions. Sangaralingam Ahilan summarises the key points. Cllr Nick Kemp (Newcastle City Council) opened the event, emphasising Newcastle City Council’s commitments to increasing the amount of blue and green in Newcastle to tackle flood risk and climate change, and to bring wider social, economic and environmental benefits to the city. Colin Thorne (University of Nottingham, principal investigator for the Blue-Green Cities and Urban Flood Resilience projects), discussed Our Journey along the Blue-Green Path to Urban Flood Resilience. Colin set the scene by introducing the themes of the two projects and emphasised that transformative change in planning, design and implementation would be required to promote adaptation of green infrastructures in urban water management. 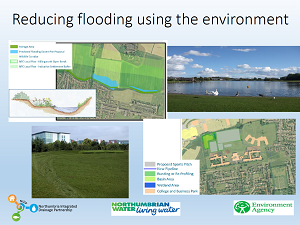 Richard Warneford (Northumbrian Water) and Leila Huntington (Environment Agency) jointly delivered a talk on The Opportunities and Challenges for partnership delivery of Blue Green Infrastructure. They outlined the core objectives of their organisations with regards to sustainable drainage and BGI and demonstrated how they had met some of their mutual objectives through the Northumbria Integrated Drainage Partnership. The partnership enabled the cost-effective implementation of several exemplar BGI schemes in Newcastle, e.g. Brunton Park, Killingworth & Longbenton. Justin Abbott (Arup) presented on Cities, Water, Resilience, and the Circular Economy, stressing that progress on sustainable water and sanitation would be impossible without progress on the other Sustainable Development Goals, e.g. sustainable cities and communities, climate action, life below water. 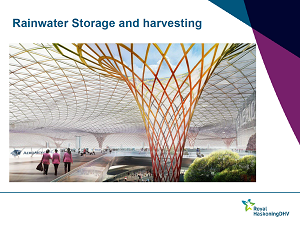 Justin explored systems-thinking, the circular economy, digital technologies and holistic urban planning to achieve a resilient urban water environment. James Harries (RTPI) discussed Boosting multi-functional BGI through the planning system, outlining several successful initiatives of incorporating green infrastructure into city and national urban planning policies. He stressed the importance of achieving integrated infrastructure planning through lobbying, training and advice, and highlighted gaps within planning policy and guidance, narrow technical standards and uncertainty about long-term management, which can considerably limit the likelihood of BGI adaptation in cities. Fola Ogunyoye (Royal HaskoningDHV) talked about Delivering urban flood resilience using blue-green approaches, exploring the impact of flooding and drought on quality of life and the economy. Fola discussed how we could change the mindset from ‘making things less bad to making things better’ and presented projects on the adaptation of BGI to manage both normal and extreme events in the UK, Netherlands and Mexico. Eugene Milne (Newcastle City Council) shared A public health perspective on BGI, opening with the direct and indirect health risks of flooding in England. He then shared national and international research findings on how access to green and open spaces positively impact on health. He finished by outlining how green infrastructures may reduce particulate matter in the urban environment. Ola Holmstrom (Sweco) introduced a Nordic perspective to BGI. He began by showing the impact of the 2011 and 2012 floods in Sweden. He then outlined how Stockholm had integrated urban green infrastructure and ecosystem service into the new city plan to cater for public access to green spaces and to cope with extreme weather events. Lisa Stephenson (Groundwork NE & Cumbria) discussed Partners and Participation: regional examples of BGI, illustrating three case studies: the Ouseburn, Wyke Beck and the Tyne Estuary, all delivered in partnership. Lisa stressed that the multi-agency partnership was more than a sum of its parts and attracted varied funding options. Gwen Rhodes (Stantec) talked about Community-based SuDS, showing successful adaptation of a number of sustainable urban drainage systems in Whitburn Spills, Roker Park SuDS and Moorlands School, Manchester. Emily O’Donnell (University of Nottingham) opened the session by introducing her research into hidden perceptions of SuDS through Implicit Association Tests. She highlighted the importance of investigating subconscious perceptions (alongside standard stated preference tests such as questionnaires) to truly understand people’s attitudes towards BGI. David Butler and Sangaralingam Ahilan (University of Exeter) discussed a move from Rainwater harvesting to rainwater management systems. David introduced the evolution from single-purpose rainwater harvesting (water supply only) to multi-purpose rainwater management (water supply and flood resilience). Ahilan shared simulation results on the potential impact of household rainwater management on water supply and flood resilience in Newcastle and Exeter. Stephen Birkinshaw (Newcastle University) presented on Flood modelling of Newcastle: getting the pipes and infiltration right. Steve explored how we could realistically account for urban green areas, soil moisture and rainfall losses in sewer networks in hydro-system modelling. He compared traditional methods with proposed refined methods. Steve stressed that “good models and good modellers should aim for the right results for the right reasons”. Glyn Everett (University of the West of England) explored BGI Community Engagement (BGI-CE), using three Bristol case-studies. Glyn spoke of the need for deeper and longer-term BGI-CE. He stated that BGI-CE should listen to, and learn from, communities, giving them some voice and control in design decisions to improve felt ‘ownership’. This may hopefully improve general behaviour, and encourage more lay-stewardship. Kim Vercruysse and David Dawson (University of Leeds) examined Interoperable flood management in Newcastle: exploring needs, opportunities and challenges. 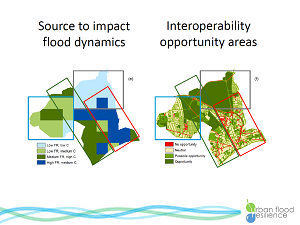 They introduced a spatial analysis framework developed to prioritize locations for flood management and identifying opportunities for interoperable adaptation solutions. By aligning data on flood dynamics with data on infrastructure systems, the framework aims to enable strategic combination of investments in transport, housing, land-use and water management. Vladimir Krivtsov (Heriot-Watt University) introduced Retrofitting, monitoring and modelling SuDS. He explored the retrofitting of SuDS at Houston Industrial Estate, Edinburgh, sharing survey findings concerning the estate’s companies’ familiarity with different SuDS options. He also outlined the impact of Eliburn and Appleton stormwater ponds on water quality, suspended sediments and ecosystem functioning. Leon Kapetas (University of Cambridge) discussed an adaptation pathways approach to deliver multiple benefits of BGI in an uncertain future. He explored how to identify the right mix of Blue-Green and Grey infrastructure to address future changes in climate and urbanisation. Leon also discussed the inherent uncertainty in developing flexible pathways and the need to account for multiple benefits. Tudor Vilcan and Karen Potter (Open University) explored Implementing SuDS through the planning system, discussing the challenges and opportunities. 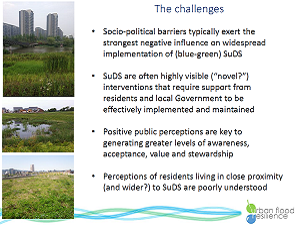 They also examined different SuDS policy arrangements in England and Wales and the effect of the SuDS policy choices on the likelihood of SuDS uptake. The final session, chaired by Emily O’Donnell and Tudor Vilcan, discussed Developing and implementing Blue-Green visions through Learning and Action Alliances’ (LAAs). Darren Varley (Newcastle City Council) and Louise Petrie (Newcastle University) shared their experiences of the Newcastle LAA, which mainly explores the potential opportunities of retrofitting Blue-Green systems in the city. Simon Harrison (Ebbsfleet Development Corporation) and Paul Kent (Southern Water) spoke about the Ebbsfleet LAA, which is investigating sustainable water use options, wherein a system dynamics model has been being developed. Read more about the dissemination event and Newcastle Declaration on our website.